IBMF artists from around the world with festival founder and local luminary Keith Terry, will perform live "snapping, clapping, stepping, singing" accompanying the BANDALOOP dancers. Check out Amelia's radio interview discussing this performance on KPFA. Pro photographers: select your 3 favorite shots from the show and send them in one email to info@bandaloop.org, subject "photo challenge." The winning photo will be shared on our Facebook fan page with credits. We will also consider it for usage on our website and newsletter. Instagrammers and Tweeps: post your photos from the show with the hashtag #danceonwalls. 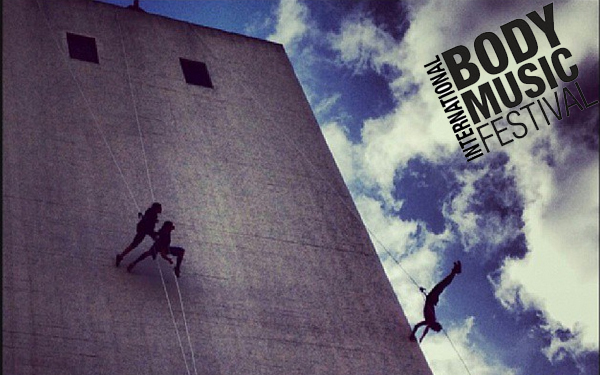 Our favorite shot will win a BANDALOOP t-shirt, our new carabiner, and loads of instalove! Note: to be eligible, (1) you must follow @bandalooping and (2) your stream must be public to be eligible.